This was one of the best weekends of football I’ve gotten to experience in a while. In four days, in three cities, I and my girlfriend took in 13 NYPHSAA Sectional Championships. The week’s planning started with two triple-headers at Ralph Wilson Stadium in Orchard Park, NY. Because of a Bills home game on Sunday, the high school games were set for Thursday and Friday. This meant that Saturday would be open. The original plan was then to drive into Pennsylvania, and see a District 10 Quarterfinal between Greenville and Northwestern, and then a short trip over to suburban Youngstown for Liberty-Gilmour Academy. It was during this planning, that I noted Syracuse was hosting four Section 3 championships at the Carrier Dome on Sunday. As the Browns were already playing on the road Thursday, I wasn’t in a big hurry to get back home. A further glance of the schedule shows Rochester was playing their regular Section 5 championships at Sahlen’s Stadium on Friday and Saturday. So, my mind was made up for me. Now, I’ve seen games at Ralph Wilson Stadium last year. And I’ve seen games at the Carrier Dome earlier this year. However, it really is a blast how New York has their playoffs structured. At least out west. So, first, a bit of a primer. New York is split into 11 sections. There are also three current organizations that do not participate in the NYSPHSAA. In addition, not all of the NYSPHSAA Sections participate in the state playoffs. The numbering starts in the southeast and works its way around. Sections 1 is in the mainland southeast corner. Section 2 is above that, covering the Albany area. Section 3 is west-northwest of that covering Syracuse and areas to the north and east. Section 4 is south of Syracuse comprising the Elmira and Binghampton areas. Section 5 is the Rochester area from Lake Ontario to the Pennsylvania line. And Section 6 is everything west of that, including the Buffalo area and the two southwest counties bordering Pennsylvania. Then, you have Section 7, which is the far northeast corner near Plattsburgh. And then, oddly, you have Section 8, which is Nassau County on Long Island. Section 9 is back on the mainland, just west of Section 1 bordering New Jersey in the Chester/Monroe area west of the Hudson. Section 10 is two large rural counties near the Canadian border centering near the towns of Malone and Potsdam. And finally, is Section 11, which is Suffolk County on Long Island. This is where it gets confusing. Only the Sections on the mainland participate in the state playoffs. Section 8 and Section 11 compete for a combined Long Island Championship. However, they are members of the NYSPHSAA. And there’s three groups that aren’t members and have their own associations and playoffs. There was four, previously, which will be noted. The most notable of non-members is the Public School Athletic League (PSAL) which is the public schools of New York City. They compete independently for their own city championship in several levels. Their levels aren’t based on school size, but rather athletic ability. A team that consistently performs badly gets moved down. Technically, only one team gets to be named the actual Champion. And in the recent past, the title games have been played at Yankee Stadium. Also in the NYC metro area, is the Catholic High School Football League. This league covers all Catholic High Schools in New York City, Long Island, and Westchester. And the last non-NYSPHSAA league is the Monsignor Martin Athletic Association. This comprises the six private schools (that play football) around the Buffalo metro area. This includes notable Ohio competition: St. Francis, St. Joseph, Bishop Timon-St. Jude, Cardinal O’Hara, Canisius, and St. Mary’s. Currently, the MMAA has three rounds of playoffs. #3 and #4 host #5 and #6 respectively. Then, on Thursday, at Ralph Wilson Stadium, #1 and #2 host the lower two, respectively. And then the following Thursday, the two semifinal winners square off for the league crown. However, back to the NYSPHSAA. The state is split up into five classifications: AA, A, B, C, and D in order from largest to smallest. The western Sections love to play groups of games at one venue over two day. Generally, Class D and A will play on a Friday evening, while C, B, and AA will play on Saturday. Section 6 hosts at Ralph Wilson Stadium, Section 5 hosts at Rochester Rhino’s home field: Sahlen’s Stadium, and Section 3 hosts at the Carrier Dome. There’s also some oddities with New York. First, is DD, D-DD, and NFF. These are odd qualifications and each is respective to its own Section. First, DD, is a classification of Section 6. Class D are generally very small schools. it’s not unusual for teams to co-op together to form bigger teams. One of the notables is Maple Grove/Chautauqua Lake. And recently, Ellicottville/Franklinville. However, Class D has EIGHT total teams in one league. The top four qualify for Class D (state playoffs), while the bottom four automatically get bumped into Class DD (not state playoffs). The logic being the four smallest schools in the Section generally never have a shot at making the state playoffs, so rather than give them their own classification state-wide, Section 6 simply gives them a semifinal and then a final at Ralph Wilson Stadium. The Class DD final was hosted as the first game on Thursday. Next up, is Class D-DD, which is in Section 5. Section 5 has two classifications: Class DD (largest schools in the lowest statewide classification) and Class D (smallest schools in the lowest state-wide classification). Each Class competes in their own Sectional Playoffs to crown Class D and Class DD champions. Then, after those two games are decided, the Class D and Class DD champions will square off to determine who advances to the statewide tournament. This ensures the really small schools get a legitimate playoff amongst eachother, but unlike Section 6, has a shot at the state championships. This Class D-DD game was played on Saturday as the opener, followed by Class B and Class AA. And lastly, is the newfound National Football Foundation Classification in Section 3. This is an opt-out league. Any small schools can opt out of the section/state playoffs and instead participate in this tournament. It carries the same setup as other sectional classifications. But, the winner doesn’t advance any further than the championship. In Syracuse, this was the night game on Sunday. And, as I mentioned, the old Buffalo City schools used to play independently for the ‘Harvard Cup’, but are now full members of the NYSPHSAA and Section 6 for the playoffs. Ralph Wilson Stadium, despite being an NFL venue, has a rather confining feel to it. Despite renovations, it’s a small bowl for the lower level that’s sunk into the ground. The stadium doesn’t rise much above the surroundings. A few hour drive up Thursday and the first game kicked off at 3pm. Attendance is meager compared to Ohio, and the stadium is only open for a few sections on the main ‘home’ side and split down the middle at the 50 with metal dividers to prevent fans from crossing over. Parking is free, and tickets were $7 for each day (no re-entry but you got to stay through all three for one price). In Class DD, Frewsburg took on Portville, and started off strong. Though Portville ran off 27 straight points to win going away, 33-14. Because of the two weekday schedules, the next game up was also a small school game: Class D with the Randolph Cardinals and Ellicottville/Franklinville. These two schools co-oped this year after being fierce rivals for years. They also co-op with West Valley, but generally not recognized by Section 6. Though there is debate on whether they’re Franklinville/Ellicottville or Ellicottville/Franklinville. Nothing seems to be official. This year they played four home games, and two were at Ellicottville and two were at Franklinville. It didn’t matter, though, as two-time defending state champion Randolph won easily 28-0. And for the nightcap, was Class A between Sweet Home and South Park. 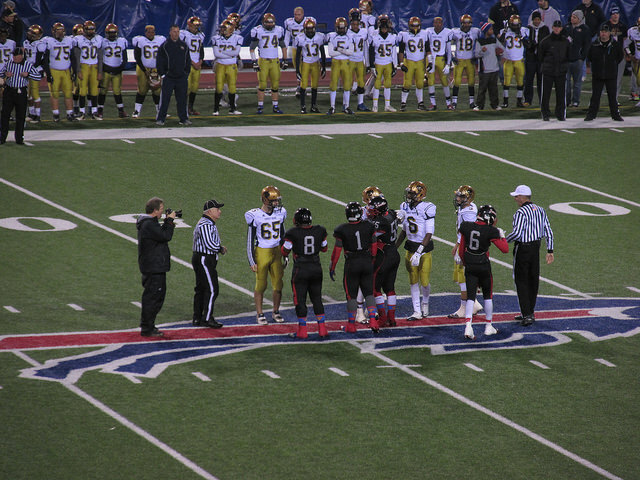 South Park is a Buffalo City school, and the first Buffalo city school to qualify for the Sectional Championship Game at Ralph Wilson Stadium. They also got to be the first to play a game (Bennett would secure a spot and play on Friday). 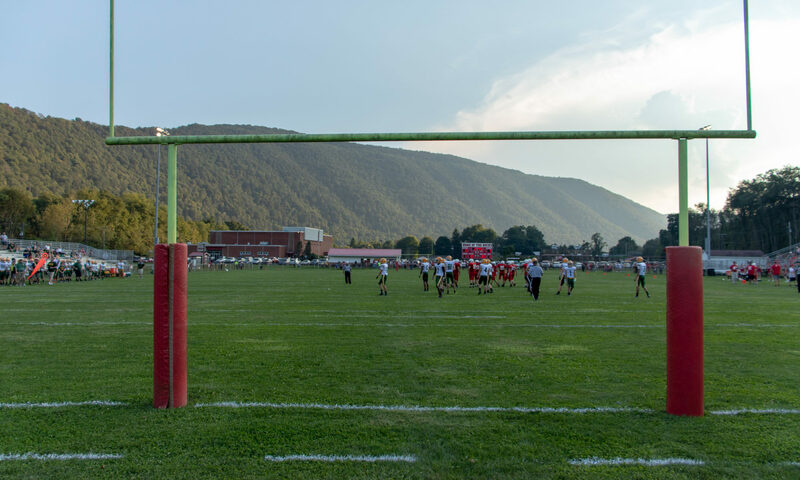 South Park held an 18-14 lead late in the third quarter after a goal line stand. However, Sweet Home, who has appeared in ten straight section championships, came back late in the fourth and turned a kickoff return fumble into another score to win 27-18. After the games, it was back to the hotel. In the morning, we visited Niagara Falls on the U.S. side and then I got to drive up along the Niagara River on the Robert Moses Parkway (which is quite scenic) up to Fort Niagara and Lake Ontario. We returned to Lewiston and stopped for lunch at a placed called Tin Pan Alley. Amazing barbeque cheeseburgers and their hot wings were exceptional. Not fiery hot, but with amazing flavor. Definitely worth it if you’re just north of Niagara Falls. We got back just in time for the Class B game kicking off at 4pm. Bennett Tigers and Cheektowaga Warriors in what is one of the greatest games I’ve seen this year. First, to set the stage: Bennett is a city school competing for the first time in a Sectional Final. Cheektowaga is the favorite, but was beaten up by the more athletically talented city school. After trading initial scores, Bennett built up a 28-7 heading into the fourth quarter. And then it happened. Cheektowaga finally started gelling offensively, and Bennett just couldn’t hang on. Score after score, until finally down 34-28. But, Bennett, much more athletically gifted, threw a 90-yard touchdown pass on the first play from scrimmage. The receiver just outran his man and took it in for the touchdown. With less than a minute to go, it looked like we’d have overtime. Though, Cheektowaga, much to my disgust, moved down the field in seconds. A play short of the yard to gain would’ve ran out the clock. However, a lineman went down with a cramp, which stopped the clock. Without an automatic runoff, it gave Cheektowaga several minutes to devise their next play. And with 5 seconds left, scored on the next play, a 40-yard touchdown pass to take the lead, and the game, 40-34. The middle game was for the Class C title, between Maple Grove/Chautauqua Lake and Southwestern from near Jamestown. The co-op team, MGCL, won easily, 37-7 over Southwestern. And the night game was regular AA participants Jamestown Red Raiders and Orchard Park Quakers. The locals, though, had no chance in this game. Jamestown is just too good, and ran away with it, 34-14. It was their second straight title. The next morning, the early wakeup was to head over to Rochester with a side jaunt down the Lake Ontario State Parkway. If you’ve read my posts in the past, you’ll know that amongst my other hobbies, is collecting counties. My personal goal is to travel into every county in the U.S., over which I only have a few hundred left to go (about 440, give or take). And one of those was Orleans County. It also gave me the opportunity to complete another goal, and that’s to drive every ‘blue line’ in a Rand McNally atlas. Blue lines being freeways or parkways. And one of those is the oft neglected and unfinished Lake Ontario State Parkway along the shores of its namesake. Arrizing to Rochester about a half hour before kickoff, I got to take it one of the more unique venues for high school football. And that’s because it’s a partially unfinished soccer stadium. In the early years of MLS expansion, the Rochester Raging Rhinos (now Rochester Rhinos) were thought to be interested in joining MLS. However, they opted to never pursue it and instead stayd in the A-League of USL. They did, however, build one very nice, though not 100% complete stadiums for their team just north of Frontier Field. The notable thing about this stadium is that the soccer lines are quite apparent, while the football lines are chalked on, and faded. Also, the open endzone has nothing but a mesh net holding fans from rushing the field, if they so chose. It does provide great sightlines and comfort. The food was excellent. The ‘Garbage Plate’ is a western New York style food that favors hot chili sauce with macaroni salad, home fries, cheese, and steak coated in onions, mustard, and hot chili. It is surprisingly very good. Also, not a bad price for the amount of food you get for $9. The stadium itself features plastic ‘formed’ seats that scale well. Some being wider than others. In the endzones, were bleachers. In addition to the green seats, were several yellow accent marks, which gave the stadium some flare. The scoreboard featured a video board that had really horrible video. Despite it, you could generally make out the replay. Because of the soccer stadium aspect, the scoreboard did not cater to downs and distance. You had to rely on the announcer or a keen eye on the sticks (which the linemarkers blended in too well at a distance). Parking was $5 and tickets were a reasonable $6 each. They also allowed re-entry. The first game up was the aforementioned Class D-DD game. In it, Red Jacket (D) and Avon (DD) competed for the matchup with Randolph in the Far West Regional. Red Jacket, the smaller school, won easily, 52-6. Avon had no ability to move the ball until it was already 52-0 and eeked out of the shutout thanks to a ‘let them eat the clock’ defensive stand. The best game of the weekend, and maybe the year, was up next in the Class B Championship. Livonia Bulldogs, featuring a Syracuse Orange-like uniform of orange and blue, was the favorite against the Batavia Blue Devils. The defenses stood strong most of the day, until it really began to get cold as the sun was down and the game was still up in the air. Livonia broke the 7-7 tie with a 22-yard touchdown run with 2:28 left. With the conversion, it seemed like things finally went Livonia’s way. And then, like the Cheektowaga game, it all unraveled. Batavia connected on a 69-yard touchdown pass on the next play from scrimmage, to trail 14-13. A bold decision to go for the two-point conversation was made, and it was successful. Unlike Cheektowaga, though, Livonia could not muster a comeback and fell, 15-14. The final game of the evening started around 6pm. It featured the Class AA Championship between the Victor Blue Devils and the Pittsford Panthers. The Pittsford team is actually a co-op between the two schools in Pittsford: Mendon and Sutherland. However, they recognize themselves as Pittsford, officially they are Pittsford Mendon/Sutherland. This game was cold, with a decent wind, and as the game dragged on, Victor slowly flexed their muscles and pulled away with a grinding 23-0 victory. After the early evening finish, it was a short drive east to Syracuse. Much to my dismay, I got the kickoff time of the opener wrong. I had thought it was 10am, but it was actually 11am. So, rushing to get to the stadium on time (we would actually have been about 10 minutes late) revealed that we were really 50 minutes early. And unlike in September, the 48-50 degrees that Dome kept throughout the day was beautiful compared to the 88-90 it was on Friday night in September. The opener featured a matchup between two of the best nickname combos you could find. The Utica Notre Dame Jugglers versus the Herkimer Magicians. This game, for Class C, however, was favored to the Magicians by four. Utica Notre Dame, though, won 32-20 in a game that wasn’t as close as the final. The next game up was the Class B final between Homer and Cazenovia. The Simpsons (nee, the Trojans), and the Lakers started off with what looked to be a decent game. But, turnovers killed Cazenovia in this one and by the time they started to make it right, they didn’t have enough time. Homer won rather easily, 38-24. After the game, we walked down the hill to The Varsity for dinner. If you’re ever in Syracuse, especially for a game at the Carrier Dome, make sure you head down to this place for some good food. Their grilled chicken sandwich was excellent, as well as their steak and cheese sandwich. It was then back for the marquee game of the night: Henninger Black Knights of Syracuse against the Liverpool Warriors of suburban Syracuse. This was projected to be a great game locally, and calpreps had it as a 5-point edge to Henninger. I had seen the Black Knights earlier in the year in their game against Christian Brothers Academy and came away impressed. After trading initial touchdowns, the score remained stagnated at 7-6, Liverpool at the half. It was the third quarter where Henninger broke things open with three touchdowns and two more in the fourth to win in a laugher, 44-7. And finally, the NFF Championship was the final game on the docket. Bishop Grimes played New York Mills earlier in the year at the Carrier Dome in a game I opted to skip because I wasn’t feeling well an chose to head home earlier as it was a long driver that weekend. This week, however, I stuck through all four games, including this one. Bishop Grimes has probably one of the best catholic school nicknames around. Nothing cliche like Crusaders, Bishops, Cardinals, or the like. Bishop Grimes is the Cobras. Something I’m sure that’s not native to the area directly southeast of Lake Ontario. Their opponent was a tongue-twister: LaFayette/Fabius-Pompey. A co-op and a combination. The school’s colors were LaFayette’s, but were referenced everywhere as at least LaFayette/Fabius or LaFayette/Fabius-Pompey. Unlike the New York Mills game to kickoff the season that went to overtime, Bishop Grimes didn’t stand much of a chance on Sunday night. The inaugural NFF Championship went to LaFayette/Fabius-Pompey for a 40-6 final that wasn’t even that close. After spending another night in Syracuse, it was a relaxed drive home. Thirteen games in four days in three cities. Two great games and a few duds. A lot of Sectional Finals decided. For Week 12, I had planned to return to Orchard Park on Thursday for the MMAA Semifinals. However the weather and other things held up those plans. The biggest was the horrible weather along the Lake Erie coast making it nearly impossible to move. So, instead Week 12 will be tame affair, by my standards. On Friday I play to see the WPIAL Class A Semifinal between Neshannock and Clairton at Canonsburg. On Saturday will be short drive east to DuBois for a 1pm District 9 Class A Semifinal between Brockway and Union. And then return west to New Wilmington, PA for the Greenville-Sharon rematch at Greyhounds Stadium. And Sunday is the Browns-Texans game in Cleveland. Next Tuesday is when the second of three big playoff road trips start. We’re heading west to Iowa for the UNI-Dome in Cedar Falls for the Iowa state championships on Thursday. On Friday, we will either see three more state championships in Cedar Falls, or travel north to Minneapolis for four games on Friday. And then on Saturday, will be three state championships in Minneapolis at the outdoor TCF Bank Stadium, home of the Golden Gophers and temporary home of the Vikings while their new home is built on the site of the old Metrodome. On Sunday will be a drive southwest to Lincoln, Nebraska for two triple-headers: one on Monday and one on Tuesday, at Memorial Stadium. Then it’s off for two days as we travel east back to Champaign, Illinois for their eight state championship games. Depending on whether Kirkwood (MO) stays in the playoffs, we may see their annual Thanksgiving Day game against Webster Groves in Suburban St. Louis. If Kirkwood is still in the playoffs, that game becomes a junior varisty game, of which I will pass up. And after the back-to-back quadruple headers at Memorial Stadium in Champaign, it will be a one-day drive back to Ohio. In total, I expect to see between 23 and 25 games in the two weeks. I will also be sure to mark several more counties on my map. Including the final one for Illinois and the final 5 for Missouri. Which will mark the 27th and 28th states I’ve completed so far.